Holiday Contest and Sweeps is pleased to work with Carpet One in their annual “Welcome A Cure” campaign. and in turn the “Welcome A Cure Giveaway” where one lucky winner will have the chance to win and choose their very own Carpet One “Welcome A Cure” Mat Design. 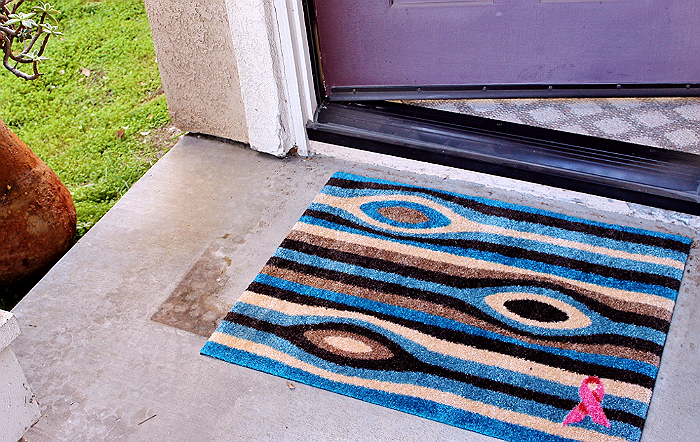 Carpet One Floor & Home’s exclusive Pink Ribbon Welcome mats are machine washable, backed with rubber and capable for use both indoors and out. Each mat is made in the USA and proudly marked with a pink ribbon, the internationally recognized symbol for breast cancer awareness . cancer is the second leading cause of death among women. and more than 40,000 will die. 1 in every 1,000 men will be diagnosed with breast cancer, this is the part that is scary, men are not even looking out for it, so we are not only losing our moms, daughters and sisters we may start to lose our fathers, sons and husbands. We need a cure for this now. Death rates from breast cancer have been declining since about 1990, in part due to better screening and early detection, increased awareness, and continually improving treatment options. How awesome is this? I am excited for the future too. It will bring even more healthy women! Right now there are nearly 3 million breast cancer survivors in the United States. Clinical breast examination every three years for women in their 20s and 30s, and annually for women aged 40 and older. Visit the Carpet One Website today for all your flooring needs. to a end at 12:00 AM (EST) 12/24/14.